The humble potato is hands down probably the most favorite vegetable of every person I know. They are so versatile. There isn’t much you can’t do with a potato. You can make it into flour, into a pancake, you can mash, fry, slice, dice, grill, roast, puree and make them into soup. You can even make pasta with them. A potato is a pretty amazing little veggie! The Stud Muffin love potatoes. He’s the stereotypical meat and potatoes kind of guy. You’ll never catch him complaining if I don’t feel like making a green veggie to go with our meal as long as their is meat and some type of potato. Potato chips are even his favorite snack. He eats way too many of them. I think I’ll teach him how to make these so that he’ll be forced to cut back on them. I’m so cruel. I used a combination of organic, non-GMO Palm shortening and some beef tallow to fry these. Please use the healthy oil of your choice. You can use coconut oil, lard, beef tallow, or palm shortening. 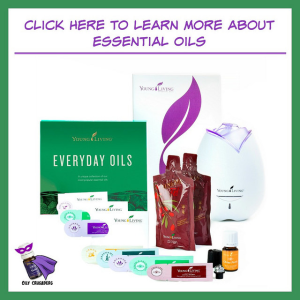 There may be other oils that have a high enough smoke point to where you can deep fry with them, but those are the ones I’m personally familiar with. I have to warn you, these won’t last long and they also don’t store well. If you put them in an airtight container and go to eat them the next day, they’ll be soft. Still good, but soft. Sometimes I’ll lay them in a single layer on a cookie sheet and crisp them up in a 300 degree oven for a few minutes. I don’t want them burnt, just a bit crisped. 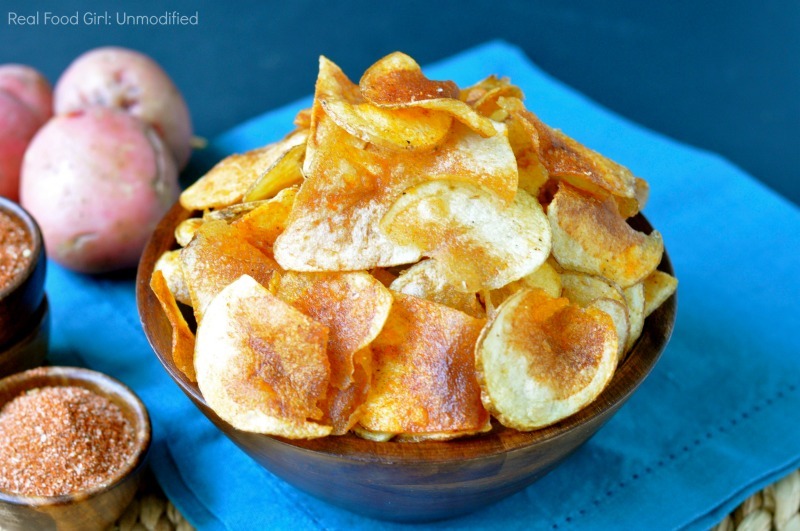 Use good old fashioned russet potatoes for these chips. Rinse them after you slice them and have them dry a bit on a clean kitchen towel so most of the excess moisture can be absorbed. You don’t have to do this step, but it will ensure that you end up with fewer soggy chips and many more crispier chips. 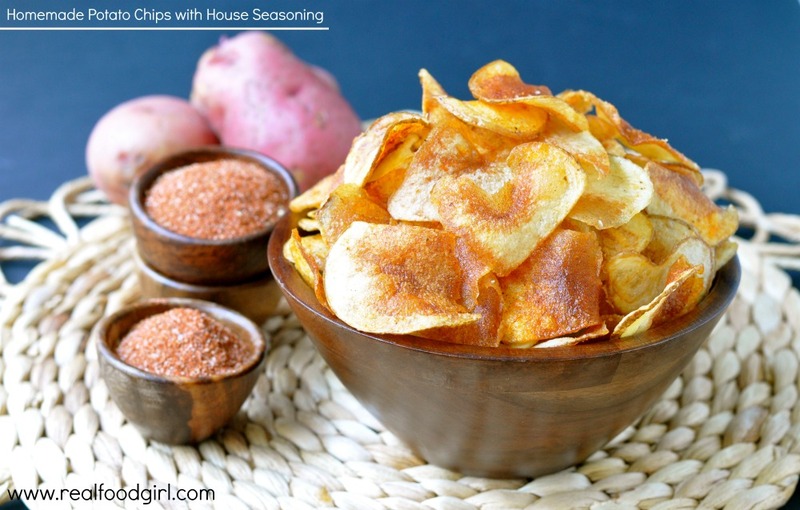 If you don’t have my house seasoning on hand, or you don’t have the spices to make it, you can just salt these chips as soon as you take them out of the oil. They are just as yummy with a little bit of sea salt. They will look a bit reddish in color because of the house seasoning mix, so keep that in mind. I slice my chips with a wicked-sharp Japanese Chef knife by Shun. You can use a mandolin, or some box graters have a spot on one side where you can thinly slice narrow veggies. You may have to cut your potatoes in half lengthwise in order to use that blade, but it depends on if your grater has that option or not. You can even slice potatoes using a food processor. Mine is a pain in the neck to get out from its storage place, so I rarely use it. When I have a larger kitchen that affords me more counter space, it’ll be prominently displayed on my counter and will get used more frequently. 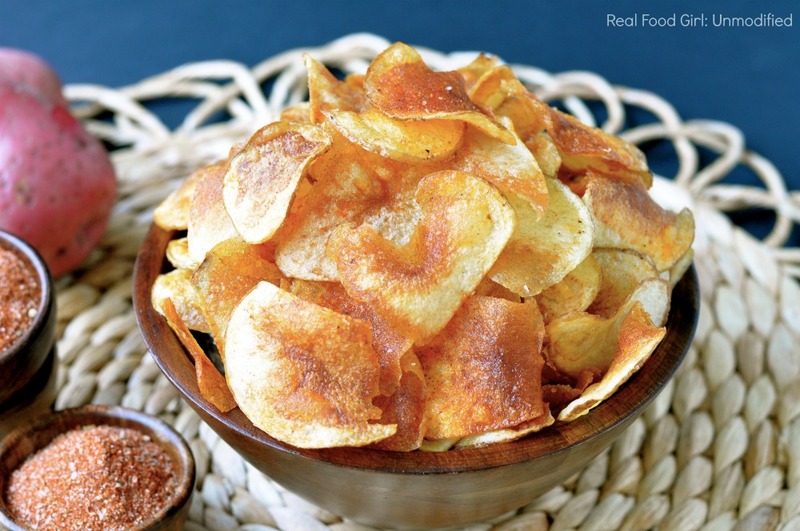 I love to make these chips when we’re having Ribs or Hamburgers. They make a great side dish. I’m all for people making their own junk food because you know what’s going into it. I use organic potatoes, organic fats, and the spices in my house seasoning are organic as well. They take some time to make so we don’t make them often. 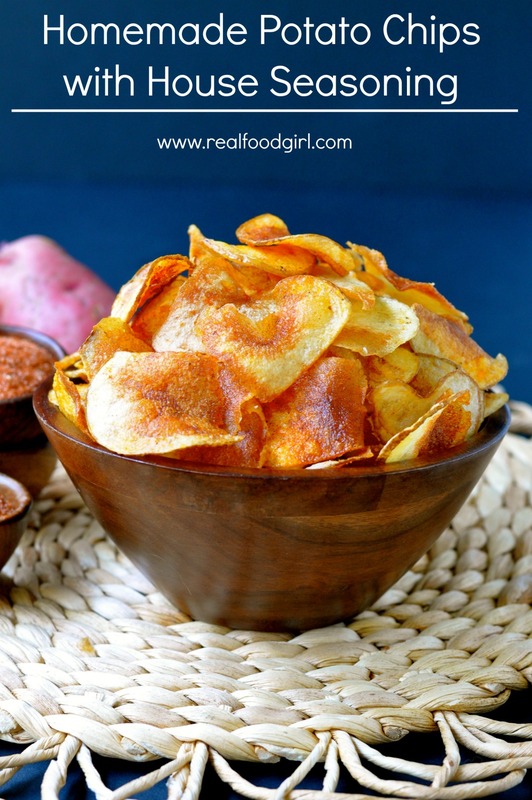 Unlike those shiny bags of potato chips fried in GMO canola or soybean oil that they sell at the store, these are a better option. Prepare a large baking sheet by layering some paper towels and then placing a cooling rack on top of the paper towels. You'll be using this to drain the chips as they come out of the hot oil. Slice potatoes super thin. Use a mandolin if you have one, or the slicing disk on your food processor. I have a section on my box grater that slices veggies really thin but it's not large enough for a potato, so I used my knife. Slice them paper thin! As you slice the potatoes, put them in a bowl with cold water. Once the potatoes are all sliced, arrange potatoes onto a clean kitchen towel and let them drain and dry. Change out the towel one time to make sure they're dried out before frying them. Water and oil don't make crispy chips. In a large, heavy stockpot, slowly heat the fat of your choice to 350 degrees. Please make sure you don't go above 350, and you may have to adjust the heat to keep the oil at 350 as it cools as you add in each batch of potatoes. Use a thermometer at all times. I have one that clips to the inside of my pan on the side. Carefully place about 15-25 slices of potatoes into the hot oil and cook for 1-2 minutes until they are golden brown and crispy. Using a spider or another heat proof, large slotted spoon, scoop up the chips, let excess oil drip off and lay on the cooling wrack/baking sheet. Immediately sprinkle with house seasoning OR salt. Add more chips to the hot oil and repeats steps 5 and 6 until all the potato slices have been fried. Enjoy these immediately. They soften the longer they sit. If you have left overs, you can toast these in the oven at like 225 degrees for a couple minutes, but you probably won't.